Your quilt is stunning! I love the blues, and the cool colors pull me right into the frozen landscape. So where would one get the pattern for this quilt? It will be free to download right here! I should have it finished this weekend, and you’ll be able to download it on Monday, Feb. 4. Yes, you should be able to download it Monday, Feb. 4. I will edit the post to add a link. Just beautiful! I love the pop of deeper blues among the icy looking ones. A perfect winter quilt. Very pretty quilt. That is a nice collection of fabric and it is perfect for your quilt. I love your design. I also love the fussy cut center of that main block. It is a perfect focal point for the quilt. Beautiful quilt. I love all these blues. Your quilt is lovely. Though I’m a “purple” person, I really like all these cool blues in this collection. Thanks for sharing. Your pattern is really pretty too. Then you’ll want to check out the “Snowberry” collection. Same tjaps, but in purples, grays and whites! Your quilt is gorgeous. I love the border you added. It really does make the icicles float. thanks for sharing. Stunning! You’ve really shown off this fabric collection. I’m fairly new to quilting so I’ve never seen a quilt constructed that way, but it worked out perfectly! What a beautiful quilt. I do love the way the glaciers float with the white border. But those blues just make my mouth water!! This is the perfect design for those blues. Your pattern reminds me of the glaciers in our South Island, and those different blues at the lower part are perfect together. What a wonderful way to sew the quilt together. Super cool shades , I feel better just looking at them after a few sweltering days of 30C plus down here. Pretty quilt and congratulations on another year. Greetings from the cold snowy east coast of Canada. Your quilt is spectacular. I have driven through Glacier National Park, and through Montana, north to south. I think it is one of the most beautiful states I have seen. Thanks for sharing your wonderful work with us. Simply beautiful quilt! I love how you took the fabric collection into account when you made it! I’m looking forward to seeing the pattern and finding Icicle in my local quilt shop so I can make it!! Beautiful! I love that you showed the sections as you worked on them. Such lovely colors for winter! Your quilt is beautiful! 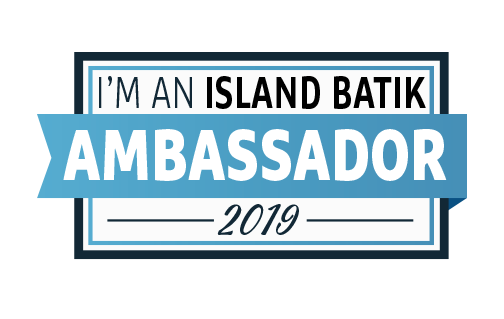 Congratulations for being an ambassador for another year. Beautiful quilt I love the colors and the design. Stunning! Captures the cold and the beauty of glaciers so well, a real pleasure to behold on this hot day on the other side of the globe! Your pattern was perfect for these batiks. Fabulous! I am sorry to see the blog hop end, it has been so inspiring. thank you for sharing. Beautiful quilt! Your pattern is great! Your quilt is just beautiful. Thanks for sharing it! Hard to be at the very end, but some of the best quilts were last – yours among them. It is a truly stunning quilt – very glacial and very gorgeous! Congratulations on a wonderful pattern. Beautiful! I love the fussy cut deer and the on point blocks. You did a fabulous job spreading out the blues. It’s a lovely design. Well done.